The biggest high-tech battle of the year is anticipated to be between the two top-selling smartphone providers in the world. While their main purpose is to gain the attention and respect of their customers, we can’t help but notice how the Samsung Galaxy S8 and the Apple iPhone 8 are trying to outdo each other once again. Let’s look at the highly anticipated features that consumers can expect from the two leading smartphone manufacturers in the industry. The new Samsung Galaxy 8 offers a brand-new design that does away with the home button and provides users with a much larger screen size. You get a screen that is 5.8 inches on the Galaxy 8 and 6.2 inches on the S8+. The S8+ also features a brand-new assistant known as Bixby. Bixby offers all the excellent features that you would expect to receive from today’s AI assistant, and plenty of extras that make it heads above the rest. You can use your voice for many of the commands that you wouldn’t have in the past. And the Bixby Vision app provides you with more information on products in stores just by focusing your camera on it. You can even aim your camera at a popular landmark and Bixby with providing you with helpful information and facts. The latest Samsung Galaxy comes with a modernized curved display screen which is known as the Infinity Display. Whether you decide to purchase the S8 or S8+, you will enjoy quad-HD resolution with both. Since the Home button has been removed from the latest Samsung phone, the fingerprint sensor is now located on the back of the device close to the camera lens. It can make it slightly difficult to reach than before and you can also accidentally smudge your camera lens. There has been talk that Apple plans to keep their fingerprint sensor, but move it so that its conveniently located under the display. The company has been testing out technology that would put all Touch ID features directly inside the screen, so that no matter where you touch your phone, you will be able to unlock it. While Samsung may have Bixby, Apple is sticking to their reliable Siri. The artificial intelligence feature is getting smarter with each upgrade and is sure to receive more updates in the coming year. Apple is hoping to fully enhance Siri in time for the new iPhone’s release. Which Phone is the Best Choice for You? Both phones have plenty of notable features that are designed to make your life easier. For some, it may come down to which carrier is offering the best deal or the consumer’s own personal preference of which phone brand they’ve always used. But if you are looking to try something new, or have used both Apple and Samsung products in the past and want to know which is best for you, you should look at all the factors involved. While Samsung seems to be raising the bar with their new and inventive features such as an experimental new A.I. and a curved screen, iPhone is mainly sticking to their basic reliable features that are less likely to fail or need a patch soon. When you look at the specifications, Samsung’s Galaxy S8 will include Qualcomm’s Snapdragon 835 processor along with 4GB of internal storage. The Apple iPhone 8 is expected to operate on an A11 chip that could be built on the phone’s 10-nanometer process. It is expected to be much faster than its predecessor and more energy efficient as well. Ever since the issues that Samsung had with their dangerous fire hazard batter with the S7, the company has taken additional precautions to ensure that the S8 is completely safe to use. The S8 comes with a 3,000 mAh battery and the S8+ includes a 3,500-mAh battery pack. The iPhone 8 is planning on using a big battery as well to prolong the standby and talk time for users. The size of the battery has yet to be announced, however, it is sure to provide more power and speed than the iPhone 7. The phones are expected to be released later this year and you should be able to purchase one from either your mobile carrier or your local retail store. Consumers should expect to pay anywhere from $750 to $850 for the Samsung Galaxy S8, and even more for the iPhone 8. 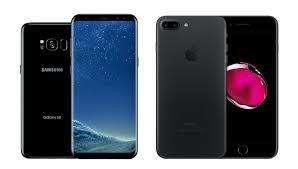 If you would love to have the latest smartphone so that you can have one of the most advanced products on the market, but don’t have enough saved up to pay for these extremely expensive products, then you should consider filling out a title loan application at your local loan office to get the cash that you need quickly before the new phones are launched.